WooshBuild, still leading the way as the others follow! WooshBuild has taken it, yet again, one step further and now removed the need for individual images for each box, you could call it "the Image Killer" really. 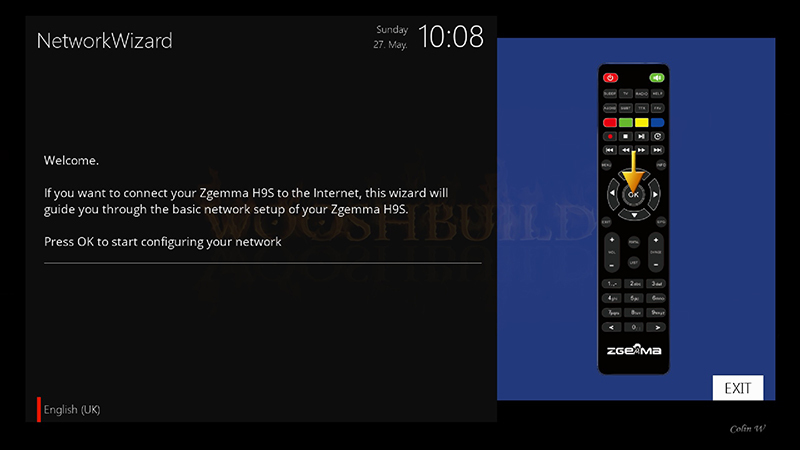 WooshBuild Infinity will work on all enigma2 boxes whether satellite, cable or IPTV Only, old or new. Satellite, cable, FreeView, sat/cable combo or just set it up for IPTV. WooshBuild Infinity only installs what is required from the choices you make. Setup screen shots - We know, you wouldn't know it wasn't all part of the openATV setup wizard! 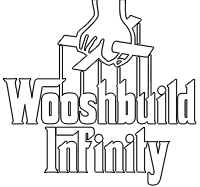 The best thing about WooshBuild Infinity is you no longer have to wait for a new version to be released for your make & model of box. 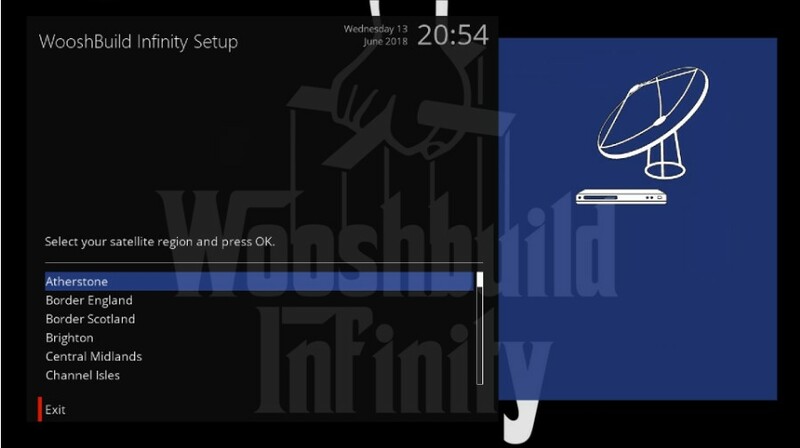 WooshBuild Infinity is always up to date each time you install it and what's more, is there are no more setting up to do. , select your manufacturer and then box model. Remember this will destroy any existing data on the box. A general guide on how to flash your box with openATV is at the end of this post. New users and existing WooshBuild users are covered. When your box is flashed with openATV you will see the Video Wizard on your TV screen. DON'T PRESS ANYTHING! At this point STOP using the remote. Click the spoiler just below this text and select the make / model of your box. It will open Webif in your browser. Webif is a built in part of your box which is where we run the command to start WooshBuild Infinity. If the above steps fail to open webif in your browser you may need to use the ip address of the box instead of the name. Using your mobile phone, Android device or Apple device, please goto the store and download the app called fing This is a basic network scanner which will find and list your box giving you the IP address. Make sure your device is connected via wireless to your router and run the app. The alternative is to open a command prompt on your computer and type: ping boxname - this will give the ip address of your box. Once you have determined the IP address of your box, open your browser and type: http://ipaddress - ipaddress being the once given by the app / ping command. Once you have webif open in your browser, scroll down on the left and click the word Terminal. opkg install http://wbuildx.co.uk/setup.ipk   and press enter. You box will restart and you will see the Video Wizard with a faint WooshBuild image behind it. You are now ready to start setting up your box. IF asked, DO NOT restore your settings at this point. That is the hard bit done, now comes the easy part. Using your remote, select HDMI and press OK. If you don't use HDMI, select the option for you. This will show the resolutions your TV can handle. Select the one best suited to your TV. If you are asked to restore your settings, you can say yes if you don't want to start with a fresh beginning. DO NOT let it install plugins. At this point some plugins you had installed may fail to install if you installed them manually or they have changed location on the remote servers. This is not related to WooshBuild Infinity. The start wizard will detect and setup your Satellite feed, your cable feed or both. 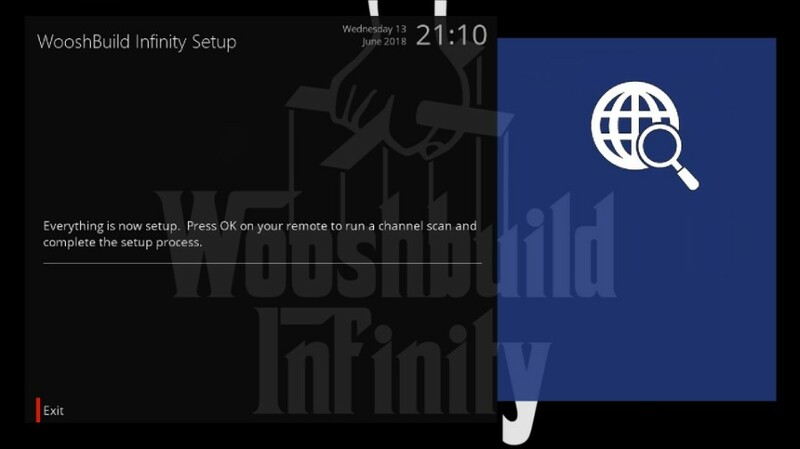 What is new with WooshBuild Infinity is the ability to just press OK on your remote every step of the way from this point. A box with satellite tuner will auto detect where your satellite dish is pointing. When it has finished scanning, press OK. It will do this for each satellite tuner in your box. Just press OK to accept defaults after each detection. The network wizard will now show. As before, just Press OK to select the default settings UNLESS you use wireless, now is the time to set it up. Once you have done the above steps you will see the WooshBuild Infinity setup screen. 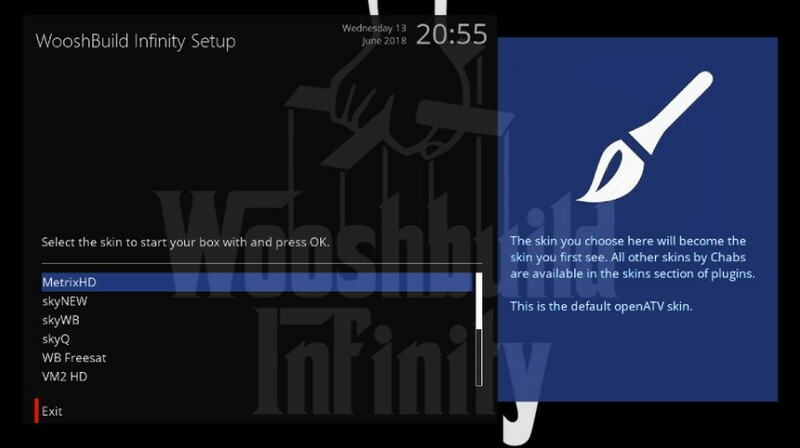 WooshBuild has always been made for simplicity and WooshBuild Infinity is no exception. If you have not initialised (formatted) your USB device for use in the box, now is the time to do so. Insert the USB (if not already inserted) and wait 5 second for the box to find it. 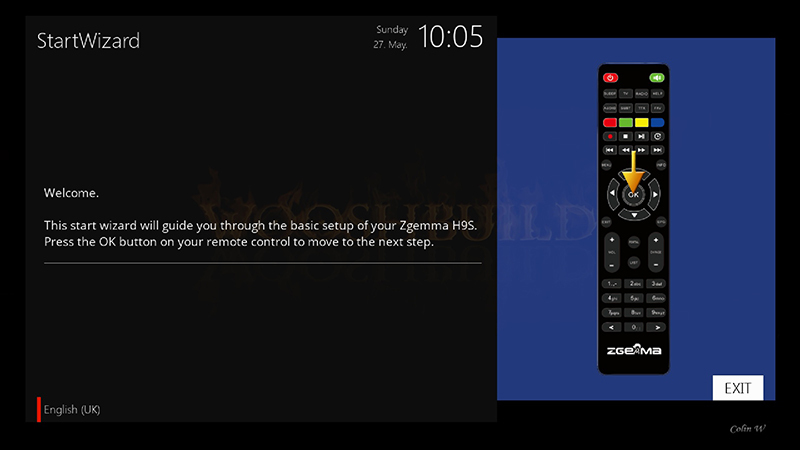 Press OK on the remote and if you need to initialise the USB device, select yes and press OK on each screen. This will initialise your USB device and create a swap file too. The swap file may or may not be used by the box but it is safer to have one than not. The next screen asks you how you want to use your box. FreeView, Satellite, cable or IPTV only. Select the one you need. IPTV must be added once setup is complete. Infinity cannot setup your IPTV due to the number of different ways of adding it. If you selected FreeView to received channels from your TV aerial you will be asked for your postcode. Select your region and or net id for your location. Now you will be asked which skin to use as default. Select your preference. 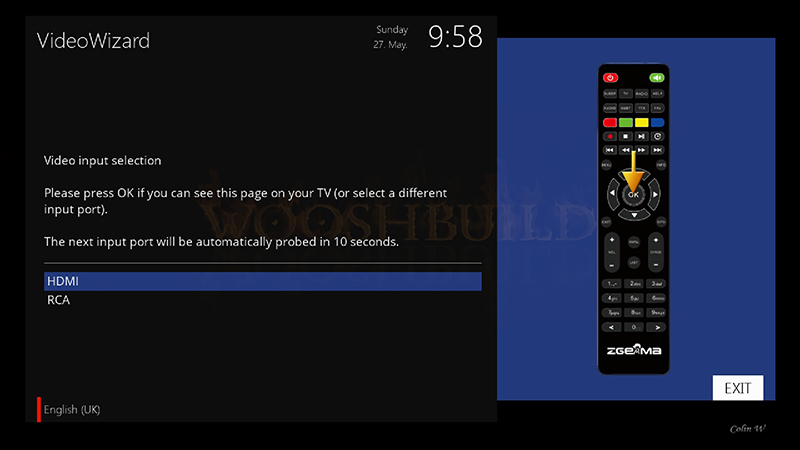 These are skins made by Chabs including the WooshBuild Freesat Skin and also SkyWB. It also includes, SkyQ and VM skins. All skins are available in the skin section of plugins and can be added and removed at will. The box will now install various plugins, your selected skin and configure your tuners. This can take some time on older boxes. Be patient. Once everything is setup, you will see the above screen. If you are using satellite or cable, pressing OK will start a channel scan. 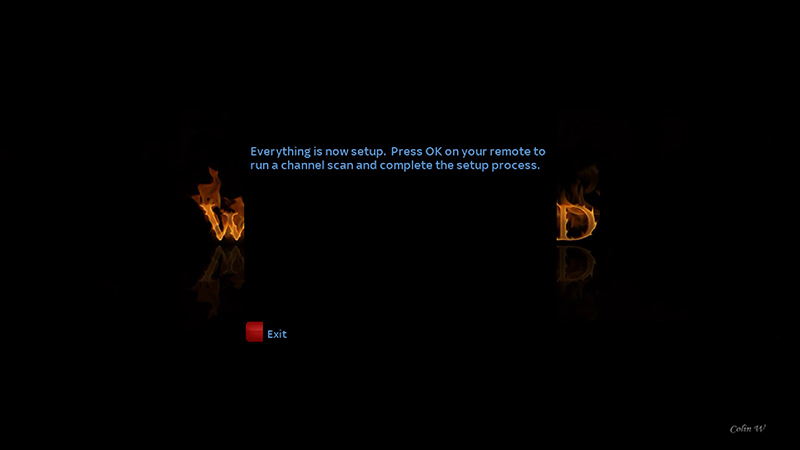 If you have chosen IPTV only, you will see a message telling your everything is setup. Press OK. At this point you will be asked if you want to setup your screen position. This is advisable as all TVs are different. This is a simple way to position your screen using simple on screen instructions. 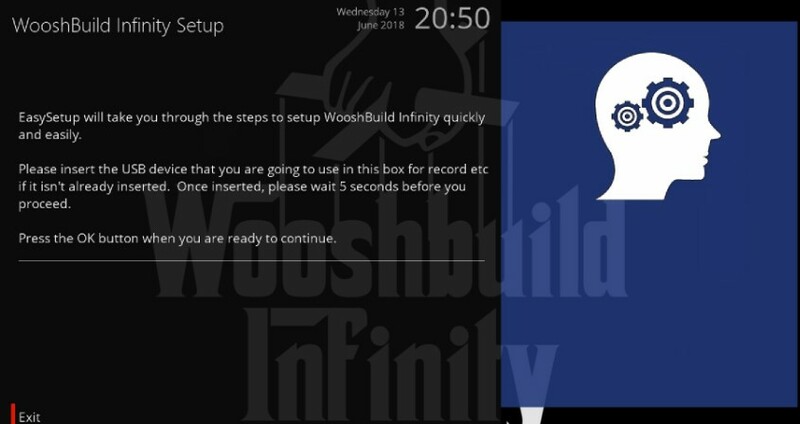 Finally, your box will restart twice.. WooshBuild Infinity is now setup, as it your box. If you are using satellite or cable you TV should be on a TV station. If you are going to use only IPTV this is the point where you need to set that up using instructions from your provider. You are able to do software updated on the box from time to time, every day or not at all. Software updates keep your box running with the latest version updates to openATV and also any plugins you may have installed. We recommend you restart your box at least once a week. This can help keep you box running smoothly. 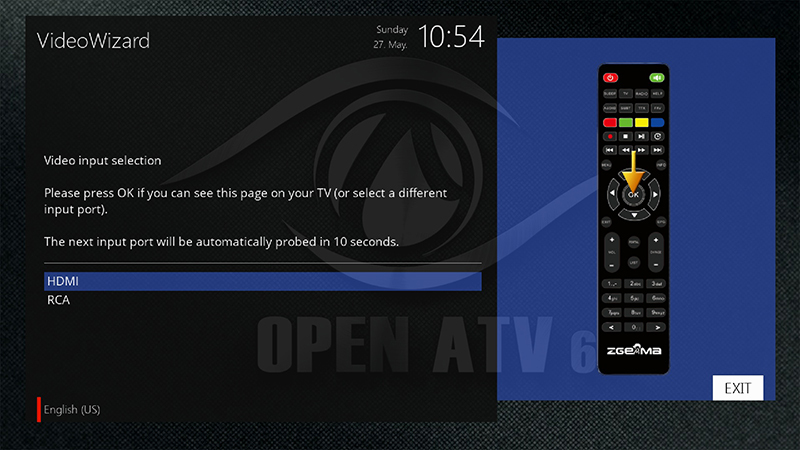 Flashing your box with openATV is simple. 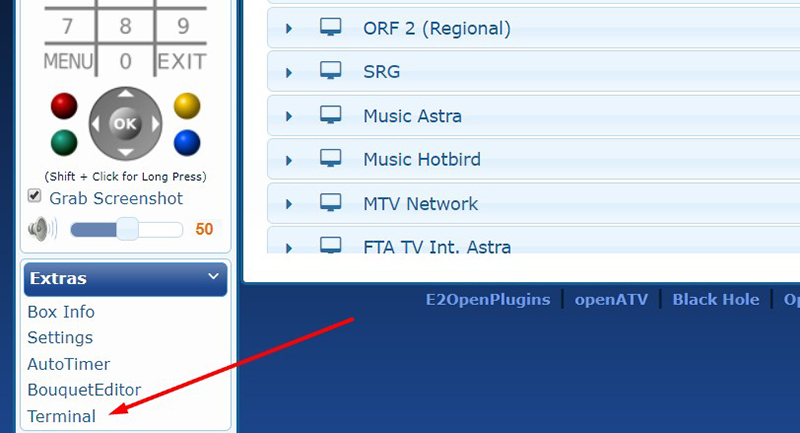 Blue button -> Flash online -> Green button -> Highlight the latest version of openATV -> Press the green button. You will be asked if you want to backup your settings. This is advisable even if you don't restore them. It saves cams, IPTV bouquets and any additional settings you may have configured. Once it has downloaded the online image of openATV, press the OK button and select option 1 to flash and start wizard. Once the box has flashed you will be at Step number 1 of the WooshBuild Infinity install instructions. You will need a USB stick, anything up to 32gb works although using a 4/8gb has best results for most boxes. When the zip file has downloaded, open the zip file and copy the ENTIRE contents to your USB stick. NOT the zip file it's self. With your box off, insert the USB and turn your box on. The H9S needs you to press and hold the reset button at the back and turn the box on until th LED turns red. The Vu+Solo4k will tell you in the LCD to press the button under the flap. A standard openATV image WILL NOT automatically flash with just the USB in the box. Once your box has flashed remove the USB and go to step 1 of the WooshBuild Infinity install instructions. Flashing openATV: Blue button -> Flash online / local -> Green - now highlight the latest version of openATV and press the green button. It will ask if you want to backup your settings, this is advisable. The box will then download the openATV image. 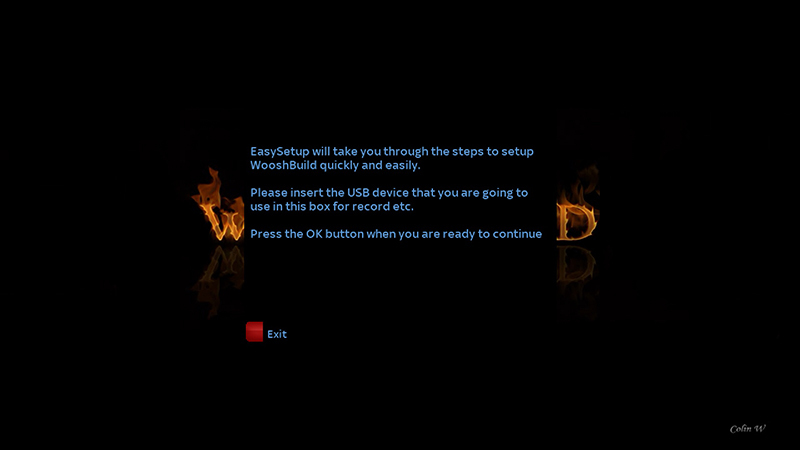 Once downloaded, Press OK to continue and select Option 1 to flash and start Wizard. 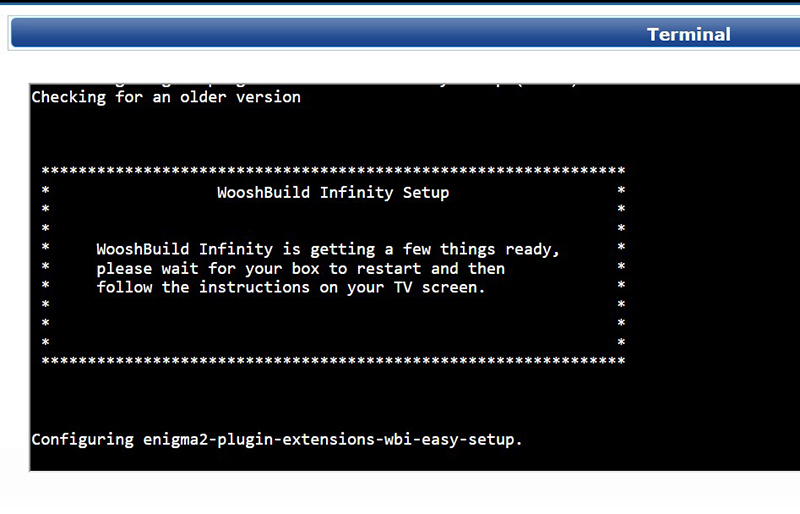 Once the box has flashed, You are at step 1 of the WooshBuild Infinity install instructions. Without the WooshBuild team and a few extra users everything would be a lot harder and take a lot longer to test and you could end up all being alpha testers which would be messy. Thank you to everyone who is involved with all the WooshBuild versions. Benijofar for testing and breaking all of his boxes from pretty much day one of WooshBuild. 2.5 years on and we are still being the first with new things. And last but certainly not least, a mad as a hatter northerner called Makido. Will flash 100 boxes in the blink of an eye to test something. Makido has done so much testing this time they have put me to shame. Send loads of PMs to Makido, it's funny! End Users: You are very important as you are the reason I keep coming up with new ideas and plugins. Thank you to everyone who runs WooshBuild, regardless of the version. Without plugins these boxes are pretty poor and thanks goes to Grog68 for his Movie Organiser plugin. Recognition to the creators of all other plugins used is given. There are 156 different type of boxes reported so far that wooshbuild infinity has been installed on. Have you got one not on this list to try ?